You'll be £19.99 closer to your next £10.00 credit when you purchase Cavalry of the Heartland. What's this? While Robert E. Lee’s Army of Northern Virginia prosecuted the war in the East for the Confederacy, the Army of Tennessee fought in the West, ranging over a tremendous expanse during the course of the Civil War, from southern Ohio and eastern Kentucky all the way to Georgia and the Carolinas. Unlike Lee’s army, however, the Army of Tennessee suffered at the hands of a series of uninspired commanders and had few impressive victories. It did have, however, arguably the best cavalry of any army in the war in terms of numbers and leadership. Led by some of the most colorful officers of the Civil War—the brilliant, passionate Nathan Bedford Forrest, the flamboyant but erratic John Hunt Morgan, and the quietly competent “Fightin’ Joe” Wheeler—and grabbing headlines for daring raids, such as Morgan’s foray into Ohio, the mounted forces of the Army of Tennessee developed a strategy of a highly mobile fighting unit that could be deployed rapidly in strength to strike deep behind enemy lines and maneuver at a moment’s notice during a battle, tactics that were to have the most impact on military operations in the future. As distinguished historian Edward G. Longacre chronicles in Cavalry of the Heartland: The Mounted Forces of the Army of Tennessee, the army’s top generals failed to recognize the battle-winning potential of their cavalry and instead sent them off on sideshow operations rather than deploy them consistently to assist the main body’s efforts. 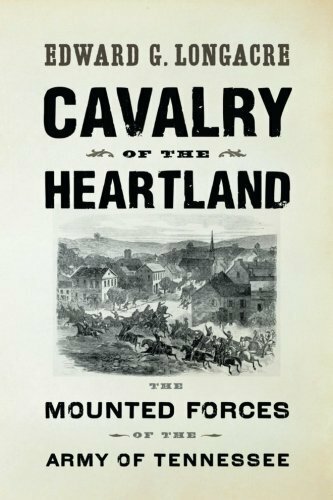 Based on a wide array of research materials, Cavalry of the Heartland is the only book-length study of the strategy and tactics of the Army of Tennessee’s mounted forces from its inception in the spring of 1861 to its final bow at Bentonville, North Carolina, four years later. Throughout, numerous campaigns and battles are described in full detail, including Fort Donelson, Shiloh, Perryville, Murfreesboro (Stones River), Tullahoma, Chickamauga, Chattanooga, Atlanta, Nashville, and the Carolinas.